“Spybaiting” is for tournament application. 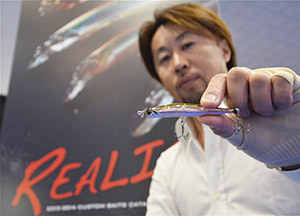 It is first very important to know the technique was designed for tournament or competitive fishing. What is the difference between a “finesse technique” and finesse technique specific to professional angling? How can a finesse technique vary in application enough for competition? Some finesse presentations were created for light line fishing, but not competitive angling. Many finesse techniques were designed to catch fish that are difficult to get to bite. No size restriction, no limit or mandate. Simple light line applications usually get anglers bit. Drop shotting was created by a Japanese shore angler named Mr. Haruhiko Murakami (around 1995). The rig was called Tsunekichi-rig. The technique reached the US about 1997. Since its arrival, drop shotting has been adapted to be more functional for competitive angling and many other situations. From line size, to hook size to weight size, drop shotting has changed and as a result tournaments have been won on it. In professional angling the goal is to get a limit of the five biggest fish and to do it over a 3-day period. Thousands of dollars are on the line. And to win one of these events may require more than 65-pounds of bass. In professional bass angling, fishing carries other variables that the regular fishing community can avoid. One good example is inclement weather, laced with heavy winds and stormy seas. In this situation, the weekend warrior can simply stop fishing, put the boat on the trailer and call it a day. But, the professional angler is required to continue fishing. Lure casting and control in the mentioned conditions is extremely difficult. Distance the lure travels, accuracy of the lure’s trajectory and even swim motion can be suppressed or completely stopped. DUO thought to create spybaits that would defeat this challenge. The Spinbait series (outside of the Spinbait 60) were specifically designed to dramatically outperform other propbaits in these conditions. While some propbaits carried a minnow body shape for the “life-like” appearance, DUO went further. The Spinbait-80, Spinbait 80 G-Fix and Spinbait 90 profiles were actually designed to reduce drag co-efficient in water and air. As the ‘angle of approach’ and force created from the load action of the rod is generated, the Spinbait’s aerodynamics helps dictate the course of trajectory and specifically reduces drag and improves accuracy. But the engineering doesn’t stop there; the shape and ballast are cohesive to creating a descent course and action that is uninhibited in wave action, once surface tension is made by the fluorocarbon. In simple terms it means the lure sinks at a rate that is perfected. DUO’s R&D team tested the profiles and ballast systems of all JDM spybaits, from which data was collected. DUO’s results directly produce more accurate and longer flight patterns with its Spinbaits that could be fished deeper. In casting tests, the Spinbaits reached distances as much as 50-feet further then other spybaits! DUO Spinbaits casted further than all spybaits in similar weight classes. We share this information to allow the professional angler to truly understand how serious DUO was in perfecting this technique. It is our prerogative to provide the professional angler with the very best tool for spybaiting. At first glance the Spinbait looks like it’s doing nothing except traveling a straight line. Closer examination show several behaviors emitted from the lure. The Spinbait engages dual propellers as it travels forward. The propellers display three distinct traits. First the propeller causes a tactile vibration called “MICRO-PULSING” which can be felt by the bass. Similar to the way we may feel the vibration of an electric razor. The rotation of blades is rapid giving off a vibrational wavelength that is soft (like a fan). The fish can feel this once the lure enters the fish sensory window. Second, the cupped prop rotation grabs and churns the water close to the lure’s body line. The disbursement of water leaves a subtle signature called “PLUME-EFFECT”. It changes the water pressure near the lures bodyline. Following fish can detect the plume-effect of the Spinbait plume. This detection could be a little like someone ever so slightly blowing air through a tiny coffee straw. The third stimulus is actually a visual effect called “STROBING”. This is the tiny yet visible rotation of blades. The intense hair-like movements of the blades are not intended to cause heavy reflection or flash like other spybaits’ blades (note their larger silver and gold blades). The intentional strobe motion is to trigger is the bass to detect (visually) the Spinbait’s rapidly compressed blade movement. Heightened motion like the spinning of the blades captures the attention of bass. 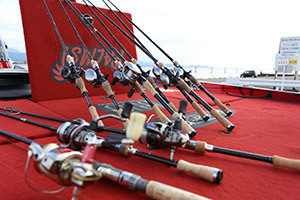 Fourth, the forward movement of the Spinbait has a rocking motion called “LISTING”. The blunted, yet fluid rocking is not erratic, or abrupt. The action emulates a bait fish casually swimming in a non threaten mode. The lure body rocks slightly to one side then the other. Final action is known as “PASSIVE MINNOW VIBRATION”. This is also coined the “Shimmy”. It is awakened once the lure begins to fall on slack line. This can occur when adjusting lure position to chosen depths. If, for example, the angler is tracing at 15 feet, and he chooses to trace at the 20-ft contour, he can do it by allowing the lure to free fall to the selected depth. 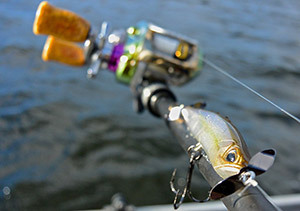 The shimmy is another attracting measure incorporated into the Spinbait. Spybaiting is a big fish technique. Spybaiting is a distinctive presentation design to target suspended fish (sometimes considered one of the more difficult fish to pursue). Spybaiting is one of few techniques that are specifically designed to work off the bottom in a water column (unlike standard drop shotting) and cover great distances. High quality, very responsive rods in the medium-light to medium rod action gives then angler an advantage of keeping big fish pegged on a relatively small lure with small hooks. The rod flexion and forgiveness keeps hooks from tearing free. The high-end spinning reels offer superior and more precise drags and componentry. The use of high quality fluorocarbon will give limited elongation, better sensitivity and better ballast management. The fluorocarbon works in unison with lure as guiding ballast. It helps the tiny lure keep course. Light or buoyant lines increase lures variance in travel (which is desired in some presentations and lures). Being able to understand and discern fish position is crucial in the specifics of spybaiting. For example, bass will face in the current of moving water. In shallow areas, certain times of the year bass will face the shoreline. Under the protection of small shade pockets bass will position in the shaded area looking outward. In post spawn, some bass in vegetation will position their backs to the grass and their noses out toward open water. Much of the describe positioning in known as ambush points. These are high percentage areas. But in spybaiting you are want to include what we call “critical edges” these are places bass can press, corner prey or even over run prey. Edges are bluff walls with depth and are very effective. Big fish will suspend off of these areas forcing prey to the vertical edge of the bluff. Actually, casting out to deep water and bringing the Spinbait into this area has proven big fish (not many small fish). Extra deep grass-ends are another great edge, these are very deep grass-ends in 15 feet. The very edges of these also work as a barrier to prey when bait is in a panic. But probably the biggest edge which is not actually an edge is “open water”. DUO’s research found big fish will suspend in open water more than they are credited, especially when pressured by anglers. The research we found was confirmed and an apparent measure actually re-confirmed in the BASS Master Northern Open where several anglers caught up 36 – to – 54 pounds of suspended smallmouth spybaiting (Spinbait 80), after three days of fishing on Lake St. Clair. 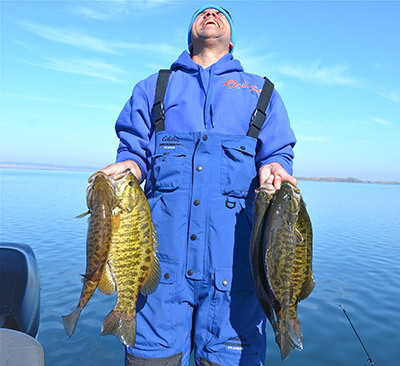 These big fish recorded (up to 6 pounds) basically ran into open water Spinbaits. Basically, the anglers knew the regular fishing pressure forced the fish OFF the bottom of 15-foot contour into 8-foot open water. By understanding how fish position with or without cover (while suspending) will increase your spybaiting success. The Spinbait`s ballast system is specifically designed to complement the angler casting range. The more proficient the angler is in long distant casting the better his spybait can maintain its steady course into the bass lair. It is important for the lure give off an almost “do nothing” display in suspended column. After a successful cast, the angler should immediately drop his rod time to help the line break surface tension. This reduces extra line movement caused by wave action or wind. As simple as this seems, it is one of the hardest constructs for some anglers to master. A slow retrieve is desired. This is makes the lure look like a non-threatened baitfish meandering along. After catching a few bass you can adjust your rate of retrieve. The slow rate of line incorporation allows the weight of the line to help guide the lure. The rate of retrieve should get the Spinbait`s props to engage in slow rotation. If you can imagine turning your handle in one complete rotation and taking about 2 to 3 seconds to complete this rotation you are headed in the right direction. At times the bass (especially schooling fish) may want a faster retrieve. However, the angler should begin with the slow the retrieve. It is the objective to have the Spinbait display a non-threatened behavior. Some lures are designed to display a dis-regulation or abrupt or erratic action. But Spybaiting is accomplished opposite of erratic action. Predators are more used to this display than researchers may know. If you think about it in this capacity, most predators “learn” to stalk their prey. They learn quickly, prey that is alarmed or frightened may be more difficult to capture. However, prey that is calm, unassuming, un-aware of their predator’s proximity can become easier prey. In this case we are using neutral prey behavior to get closer to the predator. Once the lure is in proximity of the bass, the micro-movements of “PLUME-EFFECT”, “PULSING” and “STROBING” have a significant effect on stimulating the bass. Spybaiting is an advanced technique that requires a learning curve. Although, it has attracting quality which appeal to bass, Spybaiting is a silent approach. It usually doesn’t draw fish, unless they are highly aggressive. Its power is in the silent capture. Getting the lure in front of the fish is key. Even when professional anglers have located big fish, they sometime won’t bite traditional methods. This may in part be due to fishing pressure. Trophy hunters are now using Spybaiting as they are finding out that it is extremely effective on big bass in similar condition. With the above mention noted. The angler should make a long cast (longer than usual). The angler should know the approx. depth of his desired location. The angler then, can count the lure down (rate of fall is about 8 inches per second depending on line diameter and weight) to the chosen depth, however keeping the lure off the bottom. When fish are marked on the bottom or slightly above the bottom. The spybaiter should count the lure down to several inches off the bottom. If the bass relates to 15-foot over 25-feet, then the angler should count the lure down to 14 to 16 feet. This is easier said than accomplished. It takes practice. The confidence for the angler comes from being able to position the lure, bring it into the zone. Because of the fall rate, the Spinbait’s depth range can be easily adjusted if necessary. It is important to maintain the slow retrieve. As the lure comes gradually ascends bite sometimes occur right at the point the lure begins to change in direction. It is vital to maintain the slow retrieve right to completion. If the angler comes in contact with light strands of grass, attempt to keep the lure slightly above the grass ends. The design of the lure makes hook up ratios extremely successful. It is important to “sweep-set” or “reel-set” for the hook set. A forceful snap or pull could result in line breaking or hooks tearing free. At the point you feel the fish, increase your reeling and use a long pull to imbed the hooks. The light action of the rod will fight the fish for you. Share the post "Spybaiting Techniques"